Idaho is an amazing place, full of natural wonders and a unique history as well. If you visit, you will want to make a stop in Boise, the state’s capital. There is much to see and do in Boise, especially if you have the kids in tow. If you have kids, you know that one of the first “must” stops when you visit a new area is the zoo. Zoo Boise is not only one of the most popular spots to visit in Southern Idaho, but one of the top ranked zoos in Idaho as well. This pretty location is home to many species of animals- nearly 100, in fact. But that’s not all you can see at the zoo- you can take a walk back in time and visit the Dinosaurs- this exhibit features animatronic dinosaurs that not only move, but roar as well. Kids will get a huge kick out of this prehistoric zoo visit; a little something out of the ordinary. You can have your very own up close and personal animal encounter with either a sloth bear or a giraffe- or both if you feel adventurous. Find out the day’s feeding times (available online or in the zoo’s programs when you arrive) and make sure you arrive early- there is only space for 25 participants per feeding. For just $3, you can feed the animal it’s favorite snack! There are also several play areas for the kids, food stands, and of course souvenir shops. You and you kids can also ride the carousel for just $1, and there are plenty of snack stands abound as well. Make sure you stop at the petting zoo, or Zoo Farm. 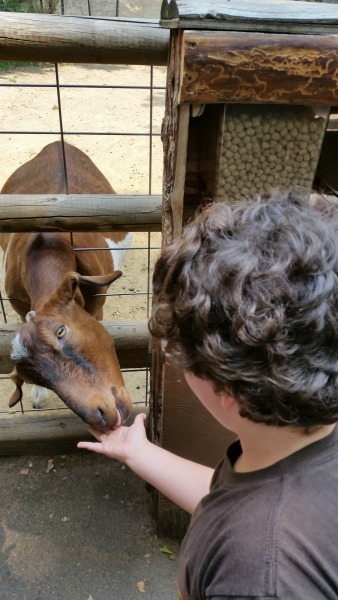 There you can feed the animals (such as goats) for just a quarter. All proceeds from the Zoo Farm go to the Zoo Boise Conservation Fund, so there is another reason to drop a few coins in. Visit with invertebrates in the octopus palace, where, along with the star octopus you can see sea anemones and more. Did you know that an octopus is about as smart as the average eight year old kid? It’s true- you can watch them play with toys, and figure out puzzles to get treats and snacks. 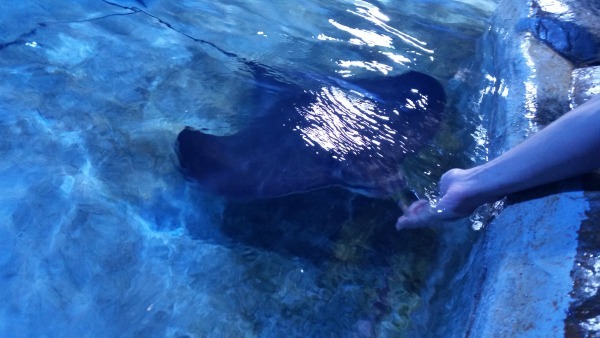 There is a shark and ray pool, where you can carefully touch these animals, as well as a beautiful “Amazing Angels Exhibit ” where you can get yet another visual and hands on experience touching and feeding the fish. There are also chameleons, dwarf caiman alligators, lizards and more. Soon there will be a Reptile Room (it’s now under construction), so keep an eye on the website for news and opening dates. The new bird aviary is yet another place where you and your children can get a hands-on feeding experience, with several varieties of Lory and parakeets. In this room, you and a caretaker enter and are given cups full of bird food. The birds will fly onto your hands and eat right from your hands- this is a very cool thing to participate in. 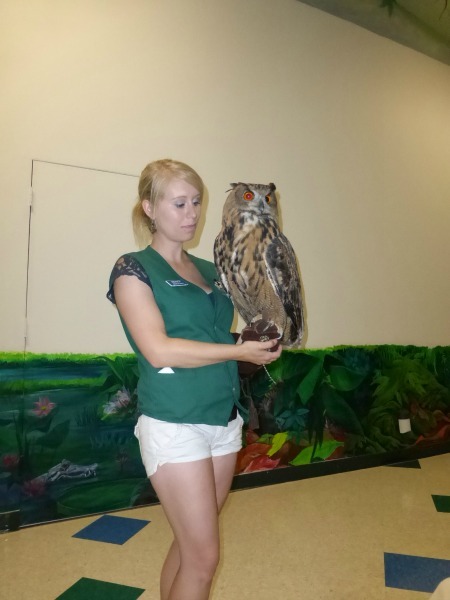 If you have not yet gotten your fill of our feathered friends, head next to the World Center for Birds of Prey. This might have been my son’s favorite spot on our trip (if not, it was a tie) to Idaho- he had a great time, and learned a lot as well. Not only are the birds amazing, but there is so much to see and do for kids as well. There are many activities for children, from coloring, to age appropriate scavenger hunts, touch screens, costumes to wear that transform your child into different birds of prey, and more. Being so close to these amazing birds in itself is amazing, and my son was in awe. There are daily live bird presentations, where you sit a mere inches to feet away from majestic birds and their handlers, who explain about the bird’s traits, habitat, what they eat, and how and why they ended up in the center. The staff does their best to care for them and train them in ways that best preserve their wild characteristics, and while many birds are able to be released back into the wild after rehabilitation (the goal of the center is to save birds of prey from extinction) some birds are not able to be returned safely. Some of the birds have imprinted on humans and are reliant on people, or have handicaps that make them non-releasable. Seeing these amazing birds up close is impressive and will leave a lasting impact on both you and your children. It’s a must see when visiting Boise. Disclosure: I received press passes in order to facilitate this review. All opinions are my own and honest. A travel and parenting expert, writer, and teacher, Samantha has dedicated her life to children and education. She feels that travel and culture should play an important part in a child’s development and exposure to their environment. Her columns usually focus on the best things to do as a family and with children in the featured destination. When she is not traveling with her family, she is at home in NJ with her husband and son. Samantha is a columnist and freelance writer who has been featured on websites, magazines, and newspapers, as well as weekly radio show co-host. You can connect with Samantha on her blog, Have Sippy Will Travel, and on social media via Twitter, Facebook, and Instagram.